Thanya Iyer sat in a sea of mattresses. In a spacious Jean-Talon St. home turned intimate concert venue, Iyer was surrounded by people draping themselves over each other. Iyer rested her head on someone’s shoulder. There was a calmness in the room as she reconnected with old friends, some of whom she hadn’t played with in years. 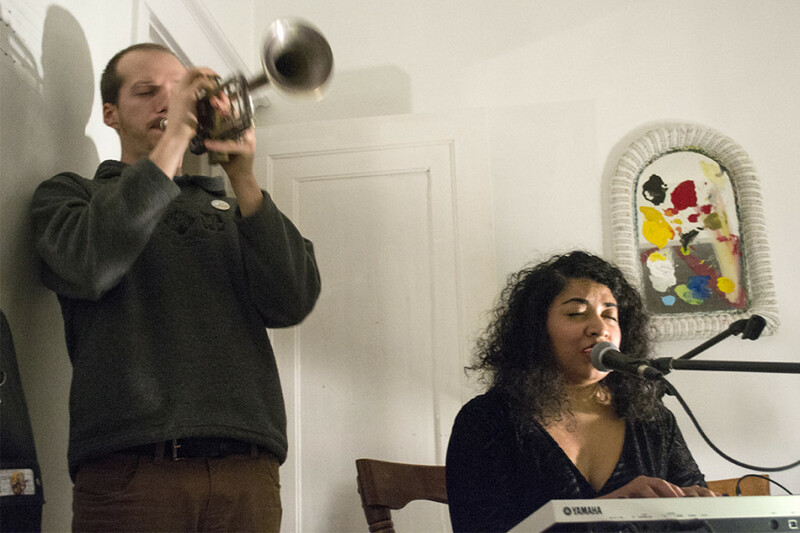 Iyer and her eponymous band recently released their debut album: Do You Dream? At the moment, she’s finishing up the last year of a bachelor’s degree in psychology at Concordia University, working in a lab, studying the connections between music and the brain. She also teaches piano and violin lessons. “In the fall semester, I realized that I couldn’t balance performing music, school and work,” Iyer said, admitting that she recently had to re-think her lifestyle after the album release. The core band is composed of multi-instrumentalist Alex Kasirer-Smibert playing upright bass, synth, and occasionally guitar; Daniel Gélinas on drums; Simon Millerd on the trumpet; and Shaina Hayes, who weaves her floral vocals through the album. Together, the band achieves a wonderful collage of complimentary sounds. Do You Dream? marked September 2016 as a milestone for the band. The album was the culmination of their adventures in music that began when Iyer, Hayes and Kasirer-Smibert first met in Cegep at Vanier College years ago. Bouncing in and out of each other’s lives since young-adulthood, the band has created a beautiful, intricate web of friendship and collaborative musical effort. They play in each other’s musical projects, like TEA—an indie folk band—or when jamming out at Shigawake Agricultural Fair & Music Festival during the summer. Their music has grown and developed much in the same way they have grown together as people. At the heart of it is Iyer. Even so, while the band produces and performs under Iyer’s name, there’s no doubt that each musician brings something of their own to the sound. The group fluctuates between three to five musicians, and they often invite other local musicians to play with them live. It shows when the band connects on stage. At their performance on Dec. 31, Iyer, Gélinas and Kasirer-Smibert’s improvisations went in a direction away from the lushness of their album. Layering glitchy electronic melodies over Iyer’s radiant voice, paired with synthy-experimental noises, it was clear that the band won’t stop evolving after the LP. The band continues to accumulate love in the local music scene by delivering magical shows with their now-unpredictable sound post-album. There is also bravery in being honest, and Iyer’s lyrics reflect her own determination to accept and acknowledge the love, loss and transformations that took place through her twenties. Right now, she’s looking forward from this fruitful part of her life. “I’m usually taking a part-time [workload] this semester, and I try to balance school and music evenly. But this year, I am working on my thesis on musical abilities in children. It was cool that I found that niche,” she said. Iyer walks a fine line between keeping options open and spreading herself too thin. With the best intentions, she tried to give herself to all of passions, but found that she eventually had a choice to make. Between the album launch, her thesis, and studying and teaching music, Iyer couldn’t balance everything the way she used to. “You can’t do everything forever. So I decided to focus on this last year of school,” Iyer said. As Iyer looks forward to completing her BA at Concordia, the band has equally exciting opportunities in the horizons. They’ll be kicking off on an U.S. tour this spring. While there, they’ll perform a show and hold a workshop for kids at the True/False Film Festival in Columbia, Missouri. With their path rolling out slowly but surely under their feet, Iyer stays optimistic and content.